Thurston eighth grader Caden Bencz warms up during practice with the newly formed Laguna Beach Interscholastic Mountain Bike Team. 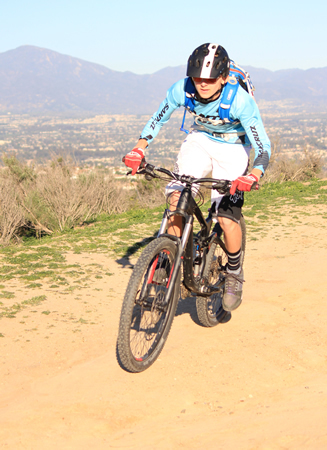 The newly established Laguna Beach Interscholastic Mountain Bike Team, made up of three girls and seven boys from Thurston Middle School, will compete this season in the SoCal League of the National Interscholastic Cycling Association. The team’s three-race schedule kicks off March 7 with the Vail Lake Challenge at Vail Lake Resort in Temecula. The SoCal League, which added a middle school division last season, is one 15 NICA leagues in 14 states, and has grown to 71 teams from 15 since its inaugural season in 2009. About half of the teams offer middle school programs. With hundreds of miles of world-class trails crisscrossing nearly 20,000 acres of open space in and around Laguna Beach, one might wonder why it took so long for the community to field a NICA team. “There were some prior efforts for sure,” said team director Tony Zentil, a long-time Laguna resident and 20-year mountain biker who works for Oakley. “We definitely have loads of amazing trails around here to practice on, and it will just raise our experience as riders,” said Thurston eighth grader Caden Bencz. 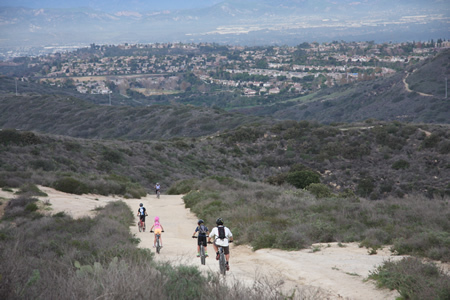 Members of the Laguna Beach Interscholastic Mountain Bike Team get in some practice at Alta Laguna Park. Bencz, who took to the trails two years ago after giving up water pole, competed in some downhill races last fall in Fontana. “It’s such an exhilarating rush when you fly down hills at top speed,” he said. As many as 50 middle and high school-aged kids turned out for that initial meeting. But fewer and fewer came out to practice over the ensuing weeks, leaving Zentil with his current crop of 10 middle schoolers. There are no tryouts or skill level prerequisites to join the team. “If you show up and you commit to practice, and you commit to training and you put in the work, you’re going to see the result. It’s as simple as that,” he said. The team practices four times a week, staging from Alta Laguna Park. For the beginners, who stay near the summit for the most part, “the focus is sort of fun, starting to build fitness, and safety,” said Zentil. 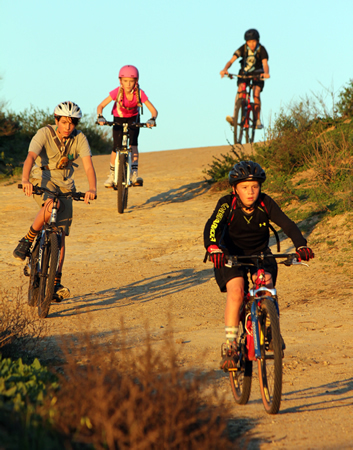 Zentil hopes that more kids join the team in successive seasons and discover the fun of mountain biking and learn NICA rules, which apply not only to practices, races, and individual training rides, but also to every bike ride as league members. NICA rules cover general safety, such as a ban on headphones and cell phones while riding, to “Leave No Trace” guidelines that promote low impact cycling. “It would be good to move kids in this direction,” said Zentil. Perhaps one of the most significant benefits of being a member of a mountain biking team can be found not on the trail but in the classroom. A recent survey found that more than half of NICA student athletes have a GPA of 3.5 or higher, and one third reported academic improvement when they joined the league. In addition, 85% have plans to attend a four-year college or university.